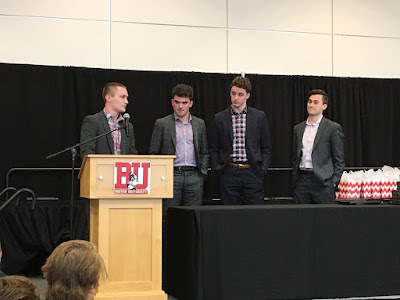 At the 55th annual Friends of BU Hockey Banquet on Sunday, individual player awards and the leadership team for 2018-19 were announced. The event was held in Agganis Arena’s Burke Room with Bernie Corbett again serving as emcee. Rising senior Bobo Carpenter and rising junior Dante Fabbro will co-captain next season’s team with a pair of juniors-to-be, Jake Oettinger and Chad Krys, serving as assistant captains. Carpenter captured a third honor, the Iron Terrier Award, given to the player deemed to have the highest degree of dedication to off-ice strength and conditioning activities. Grad transfer Drew Melanson took home two awards, Most Improved Player and Unsung Hero; while senior captain Brandon Hickey won the Bennett McInnis Award for Spirit. Two annual scholarship awards also were revealed. Fabbro received the Clifford Fitzgerald Scholarship, awarded to a rising junior or senior defenseman. Freshman Cam Crotty received the Regina Eilberg Award for top scholar-athlete.